Under Layout you can choose one of the color schemes. Typography: here you can setup the font family for all 4 main fonts of the theme. Other lets you add a favicon, show or hide the Live customizer, and set the date format for reservation form. 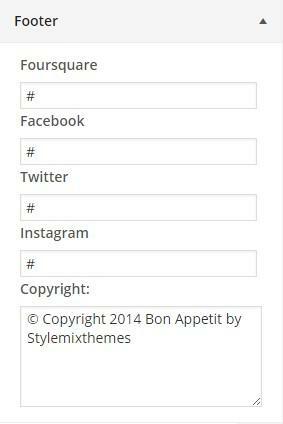 Footer: The social URL buttons appear if the link is setup. b) Click on ‘Footer’ and Drag the widgets you need.